ASP National President, Grace Adviento was a special guest to NBN Channel 4’s@ Your Serbis (At Your Service) on June 17, 2010. NBN or the National Broadcasting Network is a government owned TV Station. Hosts William Thio and Atty. Marc Castrodes interviewed Grace during the 30 minute program about autism and the programs and services of ASP. 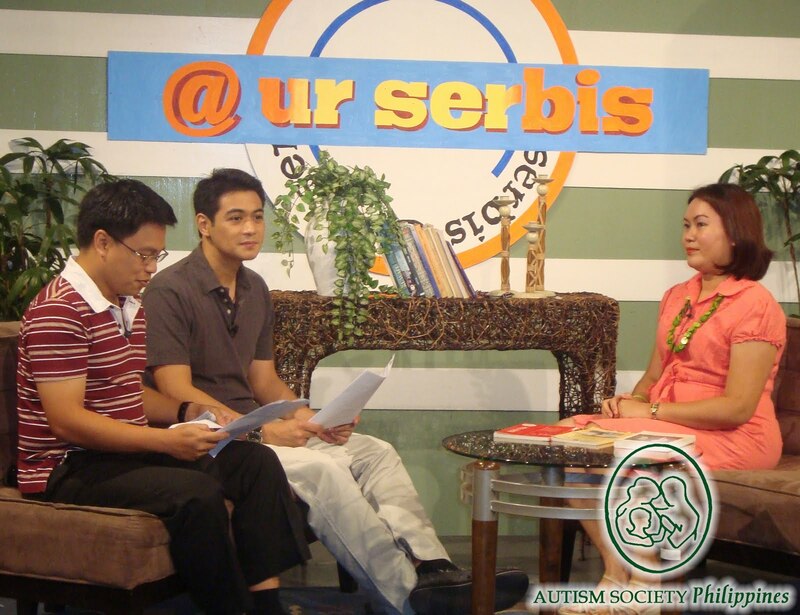 ASP National President Grace Adviento during the interview "@ ur serbis"
As head of the Public Information Committee, Grace believes that TV is a good source of information for parents or caregivers on autism. “Autism is not a disease but a condition that affects an estimated 500,000 Filipinos and only about two percent of them are given appropriate care,” she said. Grace also explained the different signs and symptoms of autism. She emphasized that early detection and early intervention is crucial for her son Andrian, who now studies in Grade Two. She also told televiewers in case they suspect a child to have autism, to seek a licensed medical professional, such as developmental pediatricians. To keep parents or caregivers informed on the latest research and interventions for autism, she also invited the televiewers to the upcoming whole day seminar-workshop on The Big Picture: Children CONNECTING to Life Experiences on June 26, 2010. Click here for more details. Acknowledgements: NBN’s @ Ur Serbis Staff and Hosts William Thio and Atty. Castrodes. ASP believes that an informed public is an educated public. Autism is not a tragedy, but ignorance is. To request an Autism Orientation in your schools or organizations, call us at 9266941 / 9298447 or email us at autismphil@pldtdsl.net.